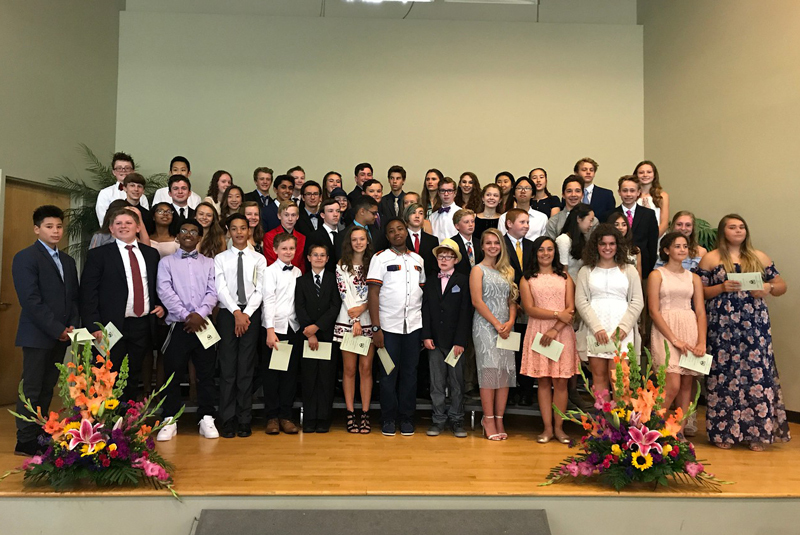 Tacoma, Wash. – The Charles Wright Class of 2021 celebrated eighth grade graduation on Thursday, June 8, in the Middle School Commons. Surrounded by family, friends, and faculty, 55 students commemorated their Middle School careers with song performances (including covers of songs by Edith Piaf, Ed Sheeran, Kings of Leon, Coldplay, and Greenday); a humorous skit imagining their Charles Wright reunion many decades into the future; and well wishes from Head of School Matt Culberson, outgoing Middle School Head Rudy Ford, and Eighth Grade Team Leader and incoming Middle School Assistant Director Rob Scotlan. Despite the lackluster weather, the new graduates spent the remainder of the day at Wild Waves Theme Park and returned to campus in the evening to celebrate at the annual graduation party in the Upper School Commons. Congratulations, Class of 2021! Below are photos from the day’s festivities. Enjoy!